MY NEW NOVELLA IS PUBLISHED! 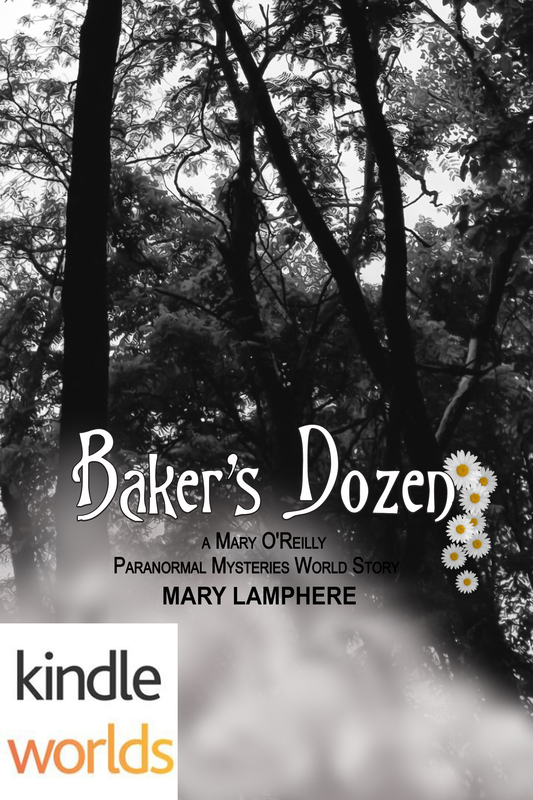 Baker’s Dozen, a Mary O’Reilly Paranormal Mysteries World story, is now available on Kindle! Baker’s Dozen is the story of Vivian Flynn, who in 1958 planned to hold a cascading bouquet of daisies when she walked down the aisle. Then tragedy struck. Nearly six decades later, she’s sitting in Mary O’Reilly Alden’s office seeking assistance in finding her long lost love. With the help of Stanley and Rosie Wagner, Mary must solve the sixty year old mystery that took the life of dedicated teacher Robert Baker and reunite his spirit with his bride-to-be. Kinder Garden is a ghost story. Baker’s Dozen is a ghost love story. Following the lead of my friend and mentor, Christine Cacciatore, author of Mary O’Reilly Kindle World stories, Trouble Lake and Grave Injury, my first novella in this world featured my own characters, Kimmie Jillison and Marc Harbour. My second offering focuses on main character Mary O’Reilly Alden as created by author Terri Reid. I’m already well into a rough draft of my next Mary O’Reilly Paranormal Mysteries World story. It’s titled, Safe Harbour, and will continue the adventures of Kimmie and Marc from book one, Kinder Garden. In Safe Harbour, Kimmie Jillison is torn between the affections of Marc Harbour, her new crush, and Liam Mitchell, the ex who broke her heart but now is back in her life. Things become even more complicated for Kimmie when a charming and handsome stranger, an amnesiac ghost, seeks her help in trying to solve his mysterious death. I have really enjoyed my experience with Kindle Worlds*. If this is something you’d be interested in as an author, I encourage you to check out the site. There are a ton of Worlds in many genres by many authors. Click here for a previous blog post on the subject. Or feel free to ask me questions. *My one complaint is the formatting. Trust me, the file I submitted is formatted correctly. I have NO idea why some chapter spacing and indents are missing in the digital download. There are some days when I am still so tickled by the fact that I am a published author. This entry was posted in Writing and tagged Baker's Dozen, Christine Cacciatore, Grave Injury, Kinder Garden, Kindle Worlds, Mary Lamphere, Mary O'Reilly Paranormal World Series, Terri Reid, Trouble Lake. Bookmark the permalink. 7 Responses to MY NEW NOVELLA IS PUBLISHED! Proud of your literary accomplishments, Mary.